GET THE CROCHET BUNNY APPLIQUE ALONG WITH THE GRANNY SQUARE PATTERN IN AN AD-FREE PDF DOWNLOAD HERE. 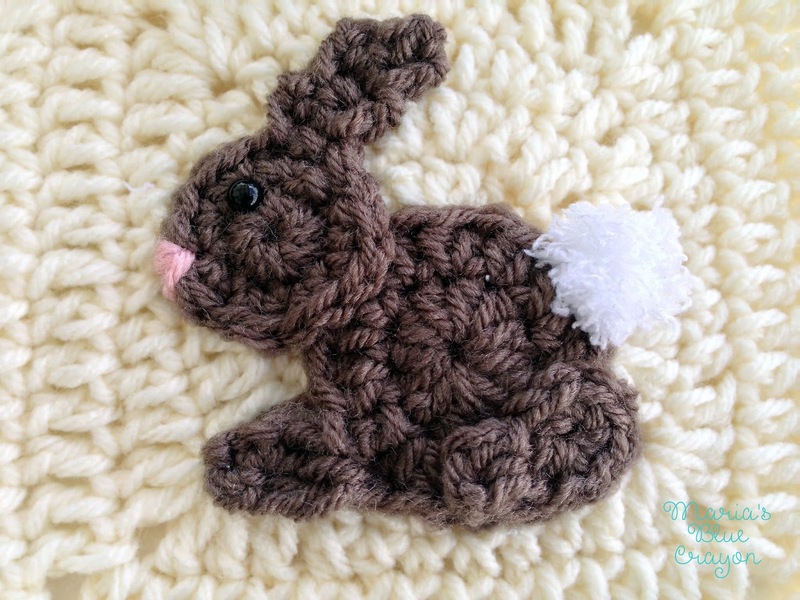 OR SCROLL DOWN FOR THE FREE BUNNY CROCHET PATTERN. Check out this cute little guy with his fluffy little tail and sweet pink nose! I went with a side view of this bunny so he would fit in with all the other creatures I have designed so far. With Easter well on it’s way, I didn’t want to mistake this bunny to being too “Eastery”. Does that make sense? I initially started designing just the head with two floppy ears, but it didn’t say “Woodland” to me, it just said “Easter bunny”. I opted for a more realistic design, and I’m happy with how the design came out! I think he makes a wonderful addition to the blanket! If you are new here, you can click here to check out the Woodland Afghan Series to see how I will be making this afghan as well as a running list of the animals I have designed so far along with the links to their tutorials/patterns. Just one more to design and that will be it for this Woodland Afghan! I am working hard to get this afghan assembled and ready to photograph once finished. Can’t wait to share the last piece of this with you next week! 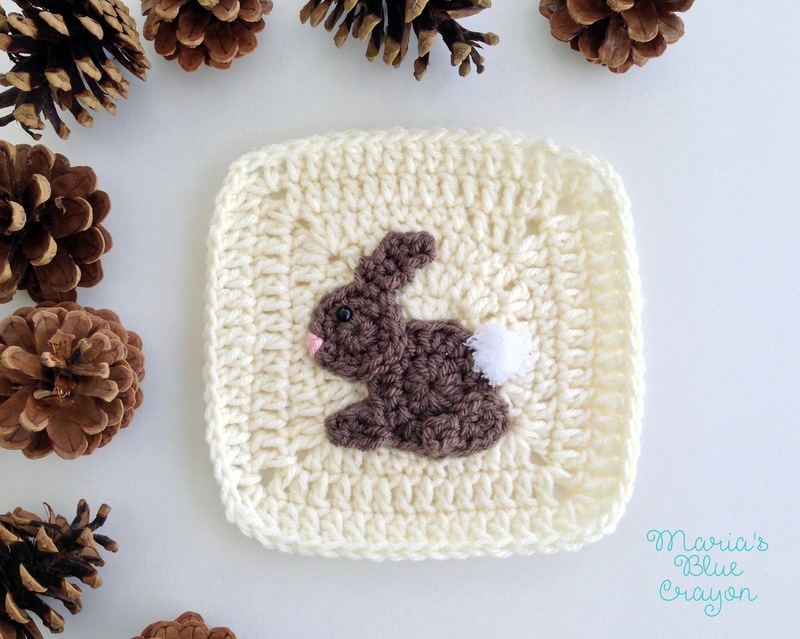 PIN IT TO YOUR CROCHET BOARDS ON PINTEREST. *I also used this type of yarn with the wolf square, but if you opt out of using this yarn, you can most certainly use a regular worsted weighted yarn (or even a chunky yarn if you have it). You may need to add more chains before joining to the first chain to ensure a proportionate sized tail. Sew the back leg onto the main body. The front leg on the body will be facing left as well as the back leg. Sew the head on the main body with the ear slightly slanting to the right. Attach safety eye to the head (you will not be able to take the safety eye off once the back is attached, so ensure proper placement before attaching). Attach tail to the main body. Sew on nose with small amount of pink yarn with tapestry needle. Beautiful little bunny! Thank you for the pattern. I can use it on an afghan, a sweater, a hat, and the list goes on! Thanks again!! I surely revel in to analyzing your posts. You’ve got published article with flawlessly! I in reality assume this internet site desires a good buy extra interest. custom dissertation writing service I’ll probably be all once more to have a look at masses extra, thanks for percentage that information. I’m satisfied to sign up for your network, found a whole lot of useful and useful facts! I'm amazed this pattern is free. How awesome are You! Each month once my bills are paid I have 100.00 to buy food and of course a bit if yarn. Thank you for your time and generosity.